« How Open To Radically Fresh Ideas Are New Testament Scholars Really? In his memoirs Michael Goulder describes the eureka moments that led him to challenge major planks of the conventional wisdom New Testament scholarship. The first of these challenges was his thesis that the evangelists (especially Matthew and Luke, but in particular Luke) imaginatively created material for their gospel narratives as opposed to being slavishly bound to now lost traditions — oral traditions and Q — and that derived directly from Jesus or his immediate followers. The early chapters of the Gospel of Luke narrate the miraculous and idyllic circumstances of the births of John the Baptist and Jesus. John’s parents, Zechariah and Elisabeth, are very old, way past child-bearing age, yet are very devout. When an angel appears to Zechariah while he is going about his Temple duties and promises him and his wife a child Zechariah finds it too much to believe. Maybe it’s the translator’s fault but it has long sounded to me like the opening scenes of a fairy tale. We must remember, however, that a good many readers, even wise and learned scholars, read it as a true story or at least as closely based on one. Michael Goulder was not the first to notice that the similarities between these stories and narratives of miraculous childbirths in Genesis — divine promises, at first disbelieved, to devout parents otherwise not able or not ready to have children. No doubt most readers of the Bible have seen that much. What took Goulder a step further was when he noticed that in addition to the similarity of story there is also a similarity in language. Luke (or whoever the author really was) read the Book of Genesis in Greek (known as the Septuagint, or LXX) and he wrote his gospel in Greek. There were certain distinctive peculiarities of expression in the Septuagint Genesis narrative that were repeated in Luke’s narrative. Well, the coincidence suggestion is shaken a little when we find the very next story (also coincidentally) again matching a subsequent birth story in Genesis. 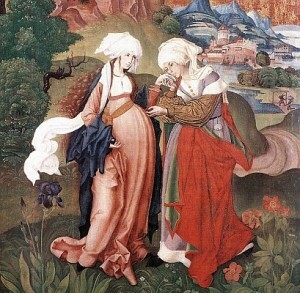 We recall that when the pregnant mother-to-be of Jesus, Mary, visits her pregnant-with-John cousin, Elisabeth, the baby John leaps a fetal somersault in the womb for joy at being in the presence of the Jesus embryo. So Michael Goulder began to pore over the text. The more I went over the text the more I felt could be explained from the Old Testament: why Zechariah was a priest, for example, why he was struck dumb for his unbelief, and even the names Zechariah, Elizabeth, Anna, and Gabriel. This was only the first of many occasions in which I came to find that the holding of religious belief proved an obstacle to the impartial evaluation of evidence. This post is titled “unwelcome creativity”. I love the idea of any author being creative. But not so the academic guild on first reading Goulder’s thesis. The argument was dismissed at a conference with a two minute synopsis and the conclusion “Typology run riot!” Goulder was to wait nearly twenty years for his vindication. In 1976 the great liberal Roman Catholic scholar, Raymond Brown spoke at a gathering at a time when it was finally widely accepted that Luke 1-2 indeed owed much to the Old Testament. But Brown decreed Goulder had gone too far in explaining even the names of the characters as creatively derived from the OT. I do not think that Luke had noticed that text. I felt vindicated over my conclusion. It was scandalous to suggest that these narratives were not historical, but I had been bold enough to draw the obvious inference. Raymond however looked as if he had ducked a clear but unwelcome conclusion. Where the parallels in the Old Testament to a story in Luke did not threaten a cherished belief, Raymond was happy to accept that Luke had inferred the stories from the OT texts. without having the evidence that they were actually historical; but the Isaiah text would imply that Luke had also inferred the Virgin Birth, and this was a cherished belief which he was not willing to abandon. . . .
Posted on 2014-08-06 21:38:19 GMT+0000 by Neil Godfrey. This entry was posted in Biblical Studies and tagged Gospel of Luke, Goulder: Five Stones and a Sling, Luke-Acts, Michael Goulder. Bookmark the permalink. The virginal conception was historical? Well what would you expect a Catholic priest to say? Denying the virgin birth would be heresy and could lead to the priest being defrocked and excommunicated. Plus it isn’t exactly the kind of thing you’d expect a Catholic to say, much less a priest. It’s the problem with believers being the only ones doing history into the early Church writ large. At least in Brown’s case his biases should be obvious and the external pressures on him clear. What two stories? At this point you had mentioned only Luke’s story. What ” Septuagint Genesis narrative?” You never say. 1)The similarities between the birth narratives of Jesus and John in Luke. 2) Septuagint Genesis narrative of Isaac’s birth. Are you Neil’s authorized spokesperson? Number 1, is Neil really talking about comparing the language of the birth narratives of John and Jesus in Luke? Neil is being very unclear. I found that a little unclear as well, but after half a minute of puzzling became certain that was what Neil meant. Could use an edit but it’s not an egregious sin or anything. Mea culpa. I evidently meant to add something there at the time of writing or accidentally removed it before posting. I have since made a clarification. Is the translation of Isaiah in the Septuagint (or in Luke for that matter) imply virginity. Was Luke trying to imply virginity at all?